In another week or so, there's going to be a conference in Greece about one of the most mysterious machines in all of human history... the Antikythera Mechanism. The Mechanism is a heavily encrusted collection of gears found a century ago off the coast of Greece at the site of an ancient shipwreck. With a creation date of approximately 80 B.C., it's one of the world's oldest known geared devices. It appears to be some sort of astronomical calculator, used for figuring out the position of the planets, but there's no definitive proof of that. But now researchers say they've sussed out the purpose of the Mechanism! They're keeping mum about their findings, waiting for the conference to unveil their conclusions. But there is a bit of a preview contained in an article in Network World. 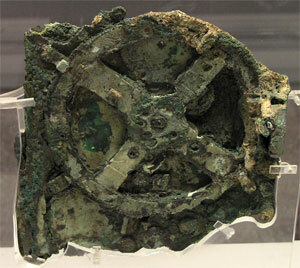 If you want to get the latest on the Mechanism (and you aren't planning on a trip to Greece at the end of November) you can sign up for the Antikythera Mechanism Research Project's mailing list.